SOUDELOR made landfall again at Fujian province last night, and has weakened into a severe tropical storm. At 8 am, SOUDELOR was centred about 170 km (90 NM) NNW of Xiamen. SOUDELOR is the 79th name in the tropical cyclone name list. It was contributed by Micronesia, and is a legendary Pohnpei Chief. This name was used in 2003 and 2009; the latter necessitated the #3 Strong Wind Signal in Hong Kong. SOUDELOR will move NNW turning to N along the western periphery of the subtropical ridge. SOUDELOR will continue to weaken on land, becoming an area of low pressure tomorrow. Affected by SOUDELOR's subsidence, the air temperature reached a record-breaking 36.3 degrees at the Observatory yesterday. As SOUDELOR moves further inland and weakens, its effects will diminish. Temperatures in Hong Kong are expected to drop as a southwesterly airstream starts to affect the territory. This is the final bulletin on SOUDELOR. SOUDELOR made landfall at Taiwan before 5 am today, and is now reaching the western side of the island. At 8 am, SOUDELOR was centred about 120 km (65 NM) NNE of Kaohsiung. 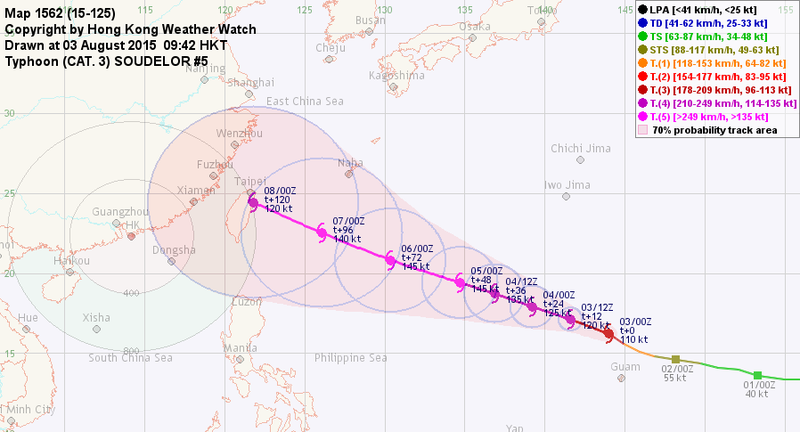 Some erratic motion is expected while the storm crosses Taiwan. 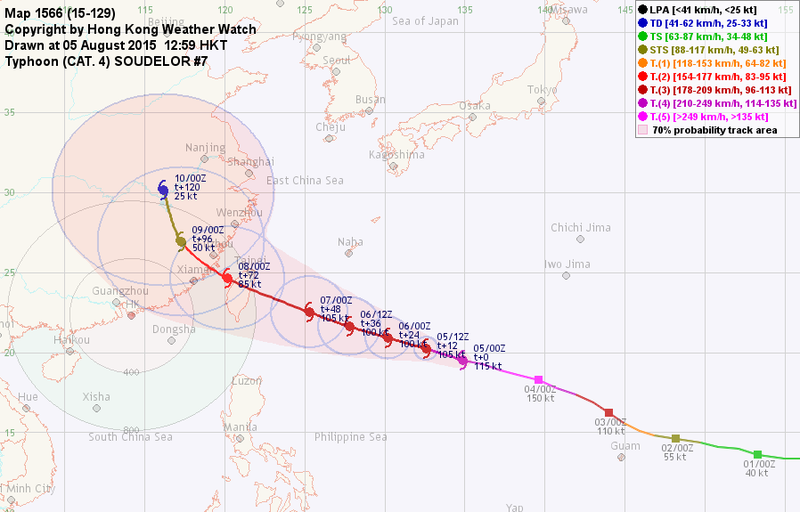 As SOUDELOR enters Taiwan Strait, it will move NW turning to N after landfall in Fujian province. The storm will round the subtropical ridge and recurve in southeastern China. SOUDELOR's eye is filled after landfall. 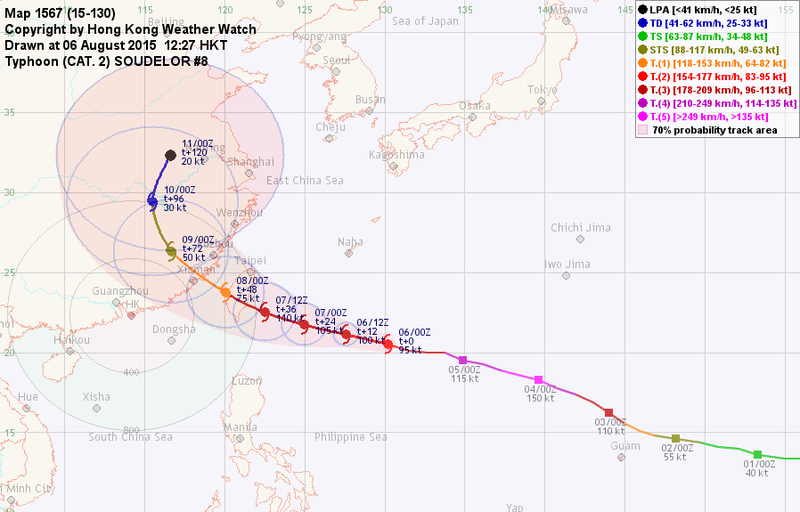 It will weaken after suffering the damage to its structure as it crosses Taiwan, but is still likely to make its second landfall tonight as a typhoon. Rapid weakening will follow as the storm moves inland. Local temperatures are generally above 34 degrees. SOUDELOR's subsidence will continue to affect Hong Kong today, resulting in very hot and hazy weather. SOUDELOR intensified again last night into a category 3 typhoon. 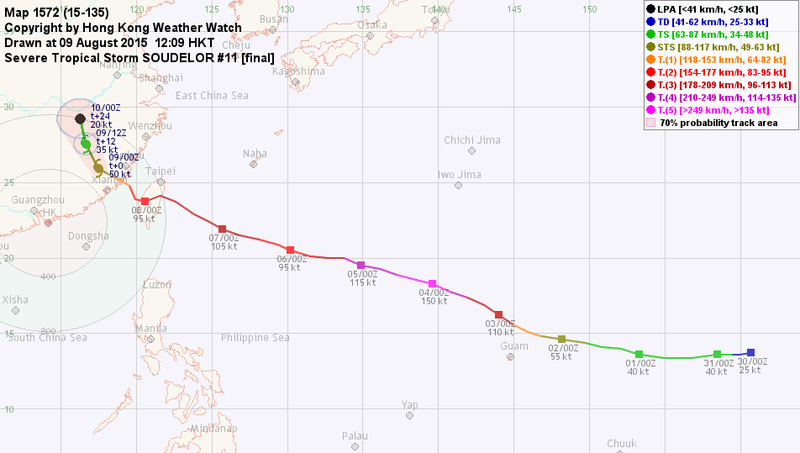 At 8 am, SOUDELOR was centred about 540 km (290 NM) SE of Taipei. SOUDELOR will continue to move WNW in the next 24 to 36 hours. As the storm reaches the southwestern periphery of the subtropical ridge, it should turn northwest as it nears Fujian, and recurve along the western edge of the ridge in southeastern China. SOUDELOR remains symmetric with a well-defined eye. It may strengthen slightly before making landfall at Taiwan tonight to early tomorrow, after which the storm will weaken on land. 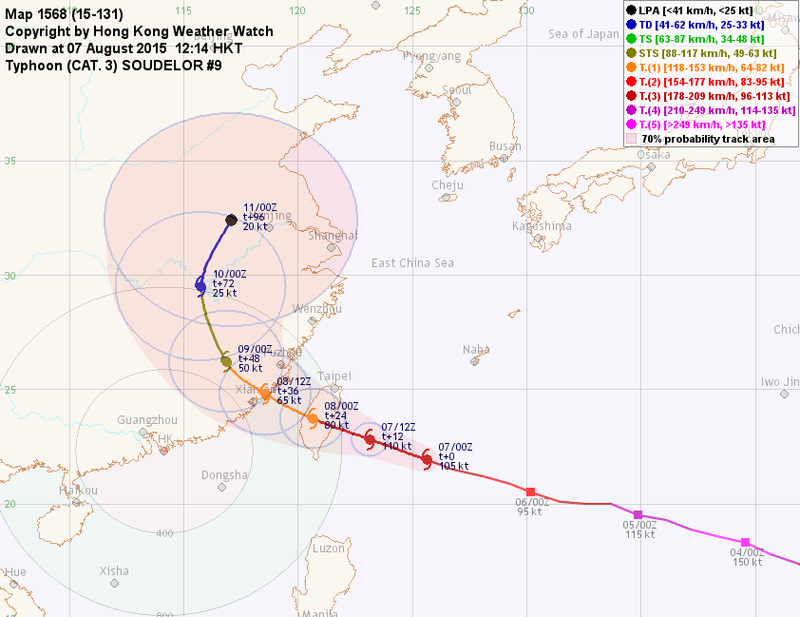 A second landfall at Fujian is expected later tomorrow; rapid weakening will take place after this landfall. 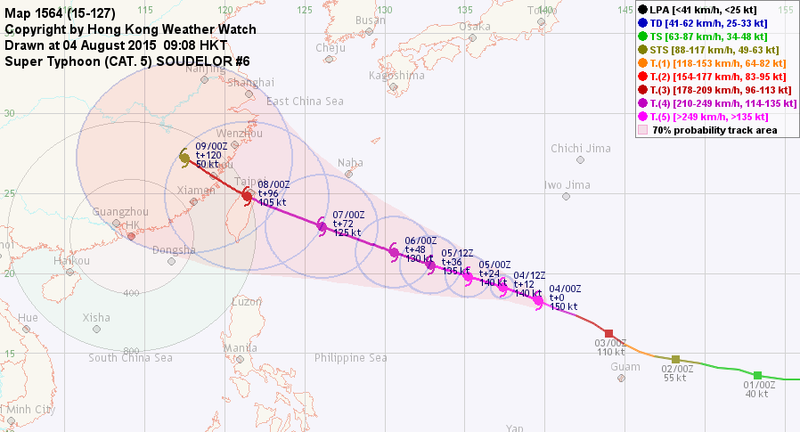 SOUDELOR's subsidence will result in very hot and hazy weather in Hong Kong today and tomorrow. SOUDELOR has weakened into a category 2 typhoon. 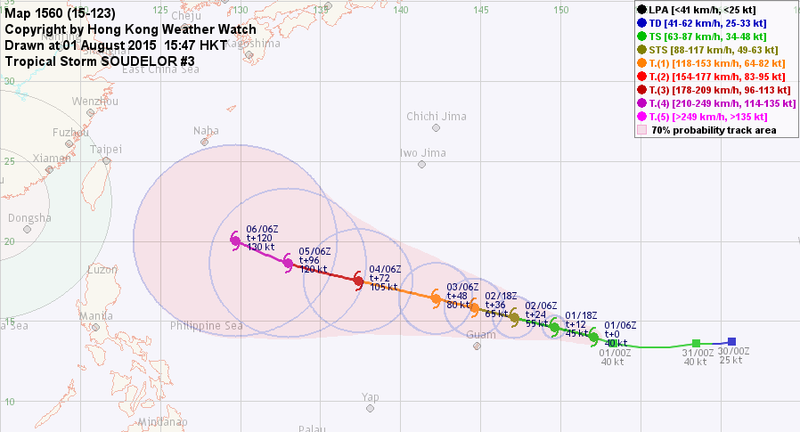 At 8 am, SOUDELOR was centred about 690 km (370 NM) SSE of Okinawa. SOUDELOR will continue to move WNW in the next 36 hours. As the storm reaches the southwestern periphery of the subtropical ridge, it should turn northwest as it crosses the Taiwan Strait, and increasingly poleward along the western edge of the ridge in southeastern China. Although weakened, SOUDELOR maintains a symmetric structure with a well-defined eye. 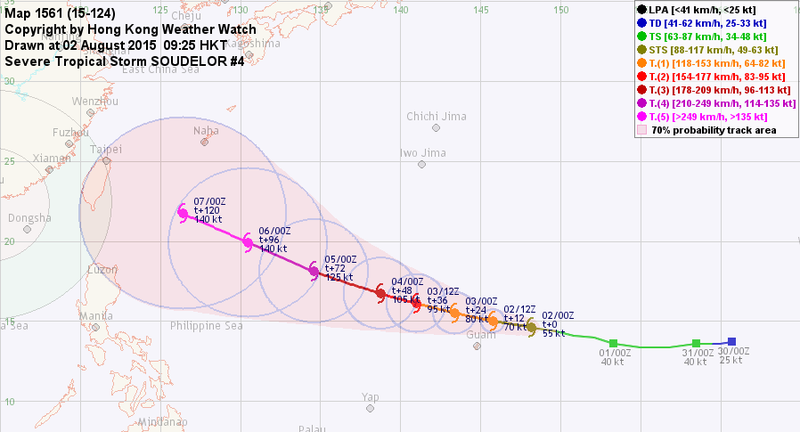 As sea temperatures are higher near Taiwan, SOUDELOR may be able to intensify before landfall. Rapid weakening follows after landfalls at Taiwan and Fujian. 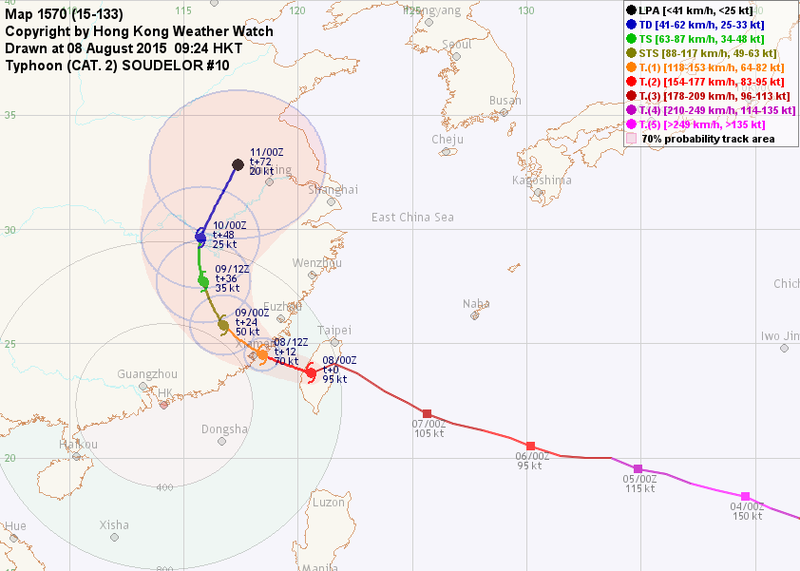 SOUDELOR's subsidence is expected to result in very hot and hazy weather in Hong Kong towards this weekend. SOUDELOR continued to weaken over the past 24 hours. At 8 am, SOUDELOR was centred about 1050 km (570 NM) SE of Okinawa. SOUDELOR will move WNW along the south to southwestern periphery of the subtropical ridge, turning poleward after crossing Taiwan as it reaches the ridge's western end. SOUDELOR's has weakened appreciably over the past 24 hours, apparently due to lower sea temperatures and weaker divergence. 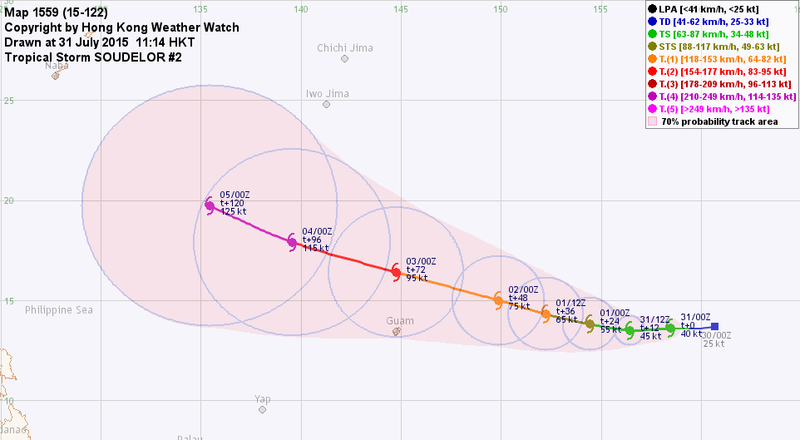 Further weakening is expected in the short run, but as sea temperatures are higher near Taiwan, SOUDELOR may be able to intensify briefly before landfall. Rapid weakening follows after landfalls at Taiwan and Fujian. SOUDELOR reached category 5 strength today, becoming the fourth such typhoon in the northwestern Pacific this year. At 8 am, SOUDELOR was centred about 1500 km (810 NM) SE of Okinawa. SOUDELOR is expected to move WNW along the southern (turning to southwestern) periphery of the subtropical ridge in the next 96 hours. The ridge will weaken at later taus, potentially leading to a poleward turn after the storm makes landfall in southeastern China. SOUDELOR's eye widened yesterday and its eyewall cloud top temperatures dropped to below -80 degrees at one point. However the storm has somewhat weakened recently. SOUDELOR has reached the maximum tolerable intensity and is expected to weaken slightly as it passes through cooler waters, but will remain as a major typhoon when it makes landfall at Taiwan. SOUDELOR intensified rapidly last night and today into a category 3 typhoon, and has tracked slightly more poleward during the past 12 hours. At 8 am, SOUDELOR was centred about 320 km (170 NM) NNW of Guam. SOUDELOR is expected to move WNW along the southern (turning to southwestern) periphery of the subtropical ridge in the entire forecast period. The ridge will weaken somewhat at later taus, but should not be sufficient to inflict a recurvature. SOUDELOR has formed a tiny eye embedded within a central dense overcast. 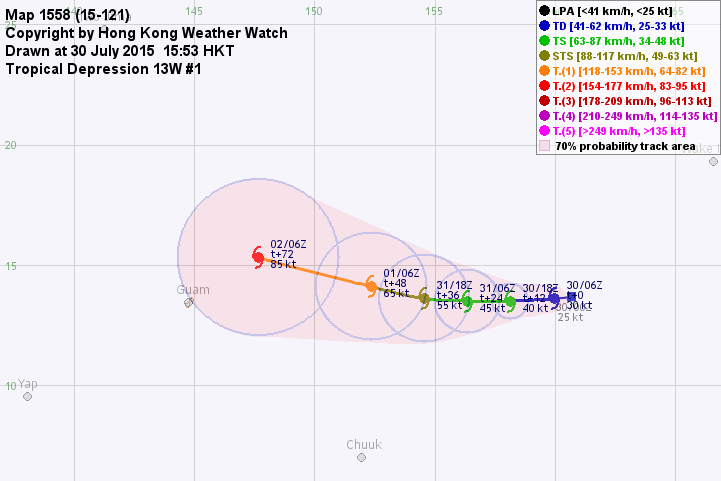 The storm will continue to strengthen in warm seas with decent outflow and low vertical wind shear, potentially becoming a category 5 super typhoon. SOUDELOR may weaken as it approaches Taiwan due to a reduction in ocean heat content and its proximity to land. SOUDELOR has intensified into a severe tropical storm. At 8 am, SOUDELOR was centred about 390 km (210 NM) ENE of Guam. SOUDELOR is expected to move WNW along the southern (turning to southwestern) periphery of the subtropical ridge in the entire forecast period. There is more variability on SOUDELOR's track at later taus due to the uncertainty in the ridge's strength, with numerical models generally agreeing on a somewhat weakened ridge that will push the storm further north. SOUDELOR's convective banding has tightened and is stronger in its western semicircle. Environmental conditions along SOUDELOR's track are expected to be very favourable for storm development; SOUDELOR should be able to become a mature typhoon within the next couple of days. SOUDELOR is moving W to WNW but did not intensify during the previous 24 hours. At 2 pm, SOUDELOR was centred about 790 km (430 NM) E of Guam. SOUDELOR is expected to move WNW along the southern periphery of the subtropical ridge in the entire forecast period. The ridge may weaken towards the end of the forecast period and its poleward track component is likely to increase. SOUDELOR is still trying to organize its convections. As environmental conditions remain favourable along its forecast track, SOUDELOR will intensify gradually in the next 120 hours. 13W has intensified into a tropical storm, and was named SOUDELOR. At 8 am, SOUDELOR was centred about 1480 km (800 NM) E of Guam. SOUDELOR is expected to move W to WNW along the southern periphery of the subtropical ridge in the entire forecast period. The ridge may weaken towards the end of the forecast period and its poleward track component is likely to increase. SOUDELOR's core is developing but its peripheral circulations are not as good. The storm will intensify in warm seas with low vertical wind shear. Tropical disturbance 93W over the northwestern Pacific has intensified into tropical depression 13W. At 2 pm, 13W was centred about 1640 km (890 NM) E of Guam. 13W is situated south of a broad subtropical ridge, and is expected to move W turning to WNW later as the ridge adjusts its shape. 13W will pass through very warm seas with low vertical wind shear. It is expected to intensify steadily in the next 72 hours.